Brighton Gay Men’s Chorus release Stonewall charity single!!! Brighton Gay Men’s Chorus began in January 2005 and now consistently numbers over 50 voices, making them the largest gay chorus outside London. They have featured on BBC’s Last Choir Standing, starred at the Barbican and developed a three season calendar, each season culminating in finale performances. On Tuesday 13th November 2012 they release their charity single called "You Make Me Proud" which is available for purchase on iTunes, Amazon mp3 and from all good online retailers. 10% of the profits from sales of the single will be donated to Stonewall, the UK national lesbian, gay and bisexual charity. 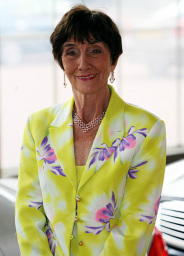 Eastenders legend June Brown (AKA Dot Cotton) recently became the choir's first Patron. "As Patron of Brighton Gay Men’s Chorus, I am thrilled to support the boys with this fabulous charity single, which is both inspirational and helps raise awareness and funds for Stonewall, to promote equality and fight discrimination." Dan Stamper, Chairman for Brighton Gay Men’s Chorus, explained that 'You Make Me Proud' was written by Howard Alexander who decided to release the song after it won an international competition run by the Sydney Gay and Lesbian Choir. As an original member of Brighton Gay Men's Chorus, Howard was keen that they take part in the recording. "I wanted to create a very positive song which was uplifting and inspirational to everyone. Brighton Gay Men’s Chorus have sung the song so well and I think they really convey the feelings I intended, about staying positive and strong and supporting one another on our continuing journey, until one day I hope, diversity will be universally celebrated, and we will be able to say to all our communities and politicians…’You Make Me Proud'." Brighton Gay Men’s Chorus will be performing 'You Make Me Proud' live during “We All Live Together: A Concert For World Aids Day” in Brighton on Saturday 1st December, in aid of the Rainbow Fund.